Bullet Shot: Athlete of the Week | The Gettysburgian. 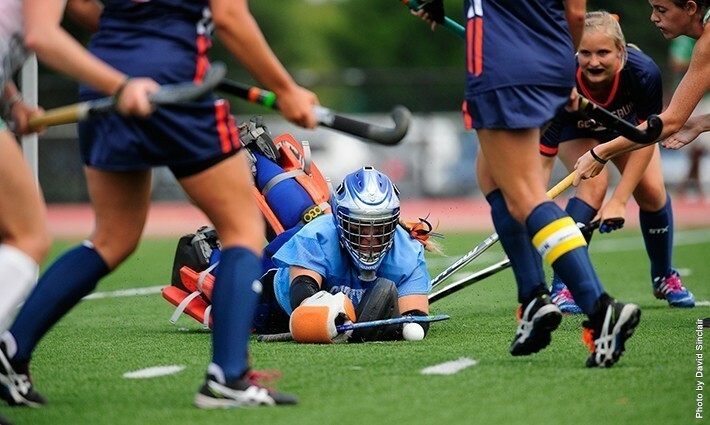 The Gettysburg College field hockey team has had some ups and downs this season. The Bullets started their season off with two wins only to be dominated by top ten-ranked Catholic University. Gettysburg was downed 4-1 by the Cardinals this week, but one player posted an outstanding game. Sophomore Haley Mowery made an outstanding 11 saves with only four goals slipping out of her reach, even with Catholic’s 23 shots on goal. Mowery definitely had help from the impressive Bullets defense, but she stepped up big in a game against a tough opponent. “I try to take every game one at a time and have been working on consistency. Meaning I want go out every game and have confidence behind the ball,” Mowery explained. That confidence showed well for the game against Catholic, and with all the hard work being put into this season, including tough summer training and continued hard work this fall, it should mean good things for the Bullets. Plus, with Mowery’s continued success in goal, the Bullets hope to be competitive in the Centennial Conference. “My personal goal is the same for every season: work hard, be committed to the team, and aim for a shutout every practice and game,” shared Mowery. For her expert goal keeping skills and infectious commitment to hard work, Mowery is this week’s “Bullet of the Week”.